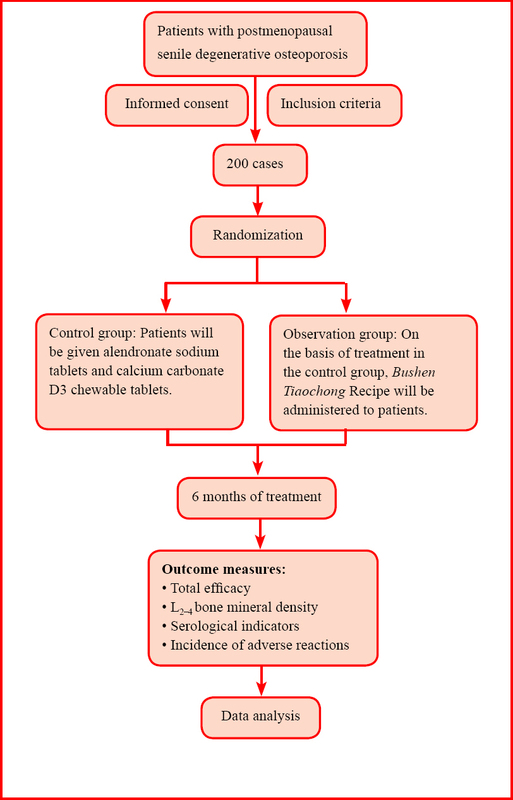 Background and objectives: Alendronate sodium is a commonly used western medicine for the treatment of osteoporosis, but it has many adverse reactions. The main component of the traditional Chinese medicine, known as the Bushen Tiaochong recipe, is Epimedium brevicornu Maxim. (epimedium). Pharmacological studies have shown that the main active ingredient of Epimedium is icariin. Icariin has an estrogen-like effect, can prevent against bone loss and improve bone strength, and has a definite effect on the treatment of postmenopausal senile degenerative osteoporosis. We hypothesize that the Bushen Tiaochong recipe combined with alendronate sodium will be more effective, as well as safer and more reliable than alendronate sodium alone for the treatment of postmenopausal senile degenerative osteoporosis. Design: A prospective, single-center, randomized, controlled, trial. Methods: Two hundred patients with postmenopausal senile degenerative osteoporosis will be randomly assigned to an observation group and a control group. In the control group, patients will be given alendronate sodium tablets 10 mg/d and calcium carbonate D3 chewable tablets 0.6 g/d. In the observation group, patients will receive the same treatment as the control group and the Bushen Tiaochong recipe, simmering, twice per day (once in the morning and once in the evening). The duration of treatment will be 6 months in both groups. Outcome measures and preliminary results: The primary outcome measure is total efficacy 6 months after treatment in both groups. The secondary outcome measures are Visual Analogue Scale scores for waist and back pain; lumbar spine (L2–4) bone mineral density; serum levels of calcium, phosphorus, alkaline phosphatase, osteocalcin, estradiol, follicle stimulating hormone, luteinizing hormone, interleukin-1, and interleukin-6 before and 6 months after treatment; and incidence of adverse reactions 6 months after treatment. The results of a peliminary experiment including 124 patients with postmenopausal senile degenerative osteoporosis who received the same treatment as in the present study revealed that at 6 months after treatment, the total efficacy, L2–4 bone mineral density, serum levels of calcium and estradiol were higher in the observation group than in the control group (P < 0.05). Visual Analogue Scale scores, serum levels of alkaline phosphatase, osteocalcin, interleukin-1, and interleukin-6 were lower in the observation group than in the control group (P < 0.05). Discussion: We hope to verify that the Bushen Tiaochong recipe combined with alendronate sodium provides better results than alendronate sodium alone for the treatment of postmenopausal senile degenerative osteoporosis. Ethics and dissemination: This trial has been approved by the Ethics Committee of the Affiliated Hospital of Qinghai University of China (approval number: QHY1703F). The study protocol will be conducted in accordance with the Declaration of Helsinki, formulated by the World Medical Association. Written informed consent will be obtained from all participants. The recruitment of subjects will begin in January 2018. Samples and data will be collected from January to December 2018. Outcome measures will be analyzed in March 2019. This trial will be completed in April 2019. The results of the trial will be reported in a scientific conference or disseminated in a peer-reviewed journal. Trial registration: This trial was registered with the Chinese Clinical Trial Registry (registration number: ChiCTR-ONC-17013947). Background and objectives: The non-steroidal anti-inflammatory drug celecoxib, used for the treatment of senile degenerative knee osteoarthritis, has a rapid onset of action and few side effects. However, it cannot prevent the occurrence and development of knee osteoarthritis. Celecoxib withdrawal is likely to induce a rebound increase in inflammation that may aggravate symptoms. Diacerein is a drug used to improve articular cartilage metabolism. It can delay the progression of senile degenerative knee osteoarthritis, but has a slow onset of action. Whether combined treatment with celecoxib and diacerein provides complimentary actions to achieve a better therapeutic effect on senile degenerative knee osteoarthritis remains unclear. Design: A prospective, single-center, randomized controlled trial. 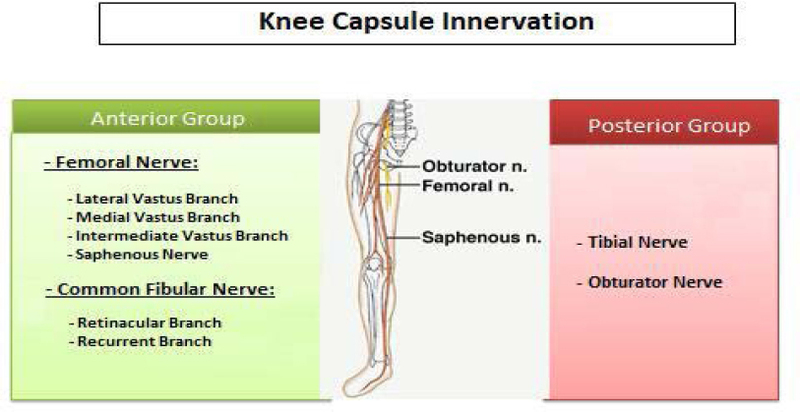 Methods: Three hundred patients with senile degenerative knee osteoarthritis who receive treatment at the Department of Orthopedics, Second Affiliated Hospital of Nanjing Medical University, China will be randomly assigned to the celecoxib (200 mg, once a day, orally), diacerein (50 mg, twice a day, orally), and celecoxib + diacerein (celecoxib 200 mg, once a day, orally and diacerein 50 mg, twice a day, orally) groups, with 100 patients in each group. Patients in each group will be treated for 12 successive weeks, and a 36-week follow-up will be performed. 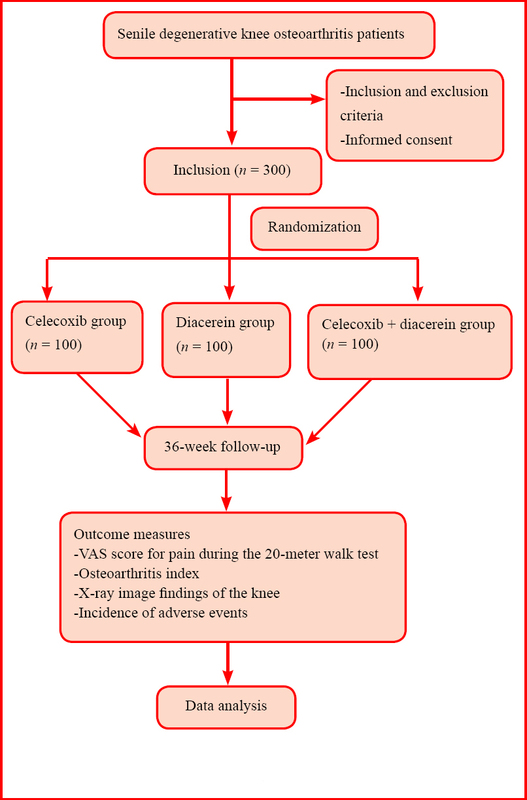 At 24 weeks after treatment, the VAS score for pain during the 20-meter walk test and osteoarthritis index were significantly decreased in the diacerein and celecoxib + diacerein groups compared to pre-treatment (P < 0.01). Outcome measures and preliminary results: The primary outcome measure of this study is the Visual Analogue Scale (VAS) score for pain during the 20-meter walk test before and 1, 4, 12, 24, and 36 weeks after treatment. The secondary outcome measures of this study include osteoarthritis index and X-ray image findings of the knee before and 1, 4, 12, 24, and 36 weeks after treatment, as well as the incidence of adverse events at 1, 4, 12, 24, and 36 weeks after treatment. 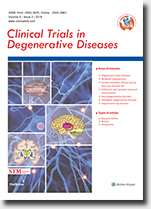 Preliminary experimental results of 210 patients with senile degenerative knee osteoarthritis who received the same treatment as in the present study revealed that at 24 weeks after treatment, the VAS score for pain during the 20-meter walk test and osteoarthritis index were significantly decreased in the diacerein and celecoxib + diacerein groups compared to pre-treatment (P < 0.01). Discussion: Results from this study will help to determine whether celecoxib and diacerein complement each other to produce a long-lasting, safe, reliable, and rapid-onset analgesic effect in patients with senile degenerative knee osteoarthritis. Ethics and dissemination: This study was approved by the Ethics Committee of the Second Affiliated Hospital of Nanjing Medical University, China (approval No. (2017) KY-091). The study protocol will be performed in strict accordance with the Declaration of Helsinki formulated by the World Medical Association. Written informed consent of the study protocol and procedure will be obtained from each patient. Participant recruitment will begin in January 2018. Sample and data collection will begin in January 2018 and end in December 2018. Outcome measures will be analyzed in January 2020. The trial will end in February 2020. Results will be disseminated through presentations at scientific meetings and/or by publication in a peer-reviewed journal. Trial registration: This trial was registered with the Chinese Clinical Trial Registry (registration No. ChiCTR-IOR-17013867). Background and objectives: Age-related macular degeneration is a condition that leads to the deterioration of the macula in older adults, and is characterized by the presence of drusen and degenerative changes of the retinal pigment epithelium and choroidal capillaries. It is a major cause of blindness worldwide. The commonly used strategies, including antioxidant therapy and dilation of blood vessels, have shown undesired outcomes in clinical practice. Ranibizumab, an anti-vascular endothelial growth factor fusion protein, is an angiogenesis inhibitor that has been used to treat wet (neovascular) age-related macular degeneration; however, patients treated with ranibizumab are prone to develop endophthalmitis, rhegmatogenous retinal detachment, retinal tears, and iatrogenic traumatic cataract. 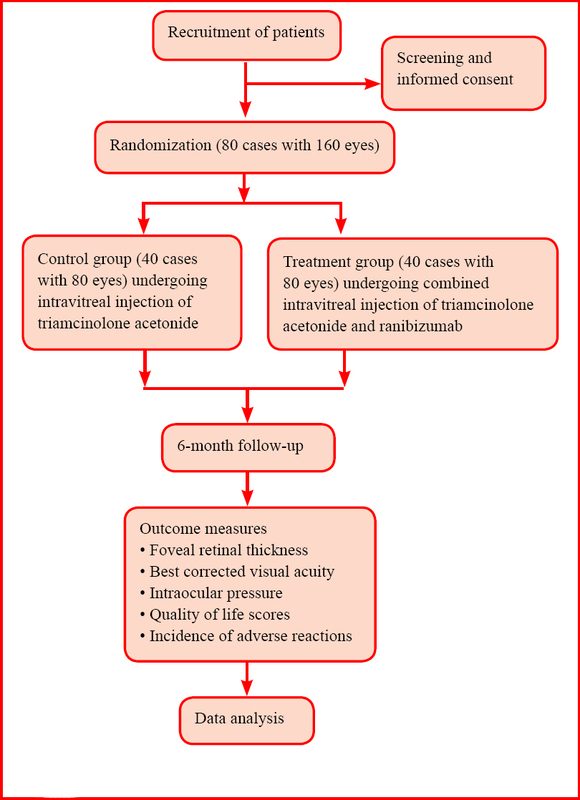 Therefore, we aim to determine the efficacy and safety of combined intravitreal injection of triamcinolone acetonide and ranibizumab in the treatment of age-related macular degeneration in a randomized trial. Design: A prospective, single-center, randomized controlled trial. Methods: Eighty patients (160 eyes) with age-related macular degeneration admitted at Jingzhou Hospital affiliated to Tongji Medical School of Huazhong University of Science and Technology, China will be recruited. These patients will be randomly assigned to control or treatment group at a 1:1 ratio. The patients in the control group will be treated with intravitreal injection of triamcinolone acetonide (0.1 mL, once daily), while those in the treatment group will be treated with combined intravitreal injection of triamcinolone acetonide (0.025 mL, once daily) and ranibizumab (0.05 mL, once a month). All patients will undergo continuous treatment for 3 months, followed by a 6-month follow-up. Outcome measures: The primary outcome measure is foveal retinal thickness before and 6 months after treatment. The secondary outcome measures include best corrected visual acuity, intraocular pressure, quality of life scores before and 6 months after treatment, and the incidence of adverse events at 6 months after treatment. Discussion: We aim to confirm the safety and efficacy of the combined intravitreal injection of triamcinolone acetonide and ranibizumab in the treatment of age-related macular degeneration. Ethics and dissemination: This study was approved by the Ethics Committee of the Jingzhou Hospital Affiliated to Tongji Medical School of Huazhong University of Science and Technology, China (approval No. 20170338), and will be performed in accordance with the Declaration of Helsinki. The participants will be informed of the study protocol and procedures and asked to sign an informed consent. Participant recruitment will be initiated in January 2018. Sample and data collection will begin in January 2018 and end in June 2018. The analysis of outcome measures and the completion of trial will be in September 2018. The results of this study will be disseminated through presentations at scientific meetings and/or by publication in peer-reviewed journals. Trial registration: This trial was registered with the Chinese Clinical Trial Registry (registration No. ChiCTR-IOR-17013865). Background and objectives: Middle cerebral artery trunk occlusion can cause large infarctions. Clinically, thrombolytic therapy, defibrillation, vasodilation, and surgery are often used to treat these large infarctions. However, the therapeutic efficacy of these therapeutic interventions in promoting prognosis remains controversial. Nalmefene, an opioid receptor antagonist, exhibits a neuroprotective effect. Few clinical studies have reported on the therapeutic efficacy of nalmefene in the treatment of large cerebral infarctions. In this study, we investigated the therapeutic efficacy of nalmefene in restoring the neurologic function of patients with middle cerebral artery trunk infarction while using conventional treatment as a control. Design: A randomized, controlled, prospective trial. Methods: Two hundred and thirty-six patients with middle cerebral artery trunk infarction who will receive treatment at the First Hospital of Jilin University in China will be randomly divided into a control group (n = 116) and a nalmefene group (n = 120). Patients in the control group will receive conventional treatment. Patients in the nalmefene group will receive 10 successive days of intravenous nalmefene hydrochloride injection based on conventional treatment. Outcome measures and preliminary results: The primary outcome of this study is the efficacy rate at 20 days (i.e., 10 days after treatment). The secondary outcomes of this study include (1) the National Institutes of Health Stroke Scale (NIHSS) score at 20 days, which is used to evaluate neurologic function deficits; (2) Glasgow Coma Scale scores at 0 days (before treatment) and 10 days; (3) serum level of matrix metalloproteinase-9 at 0, 5, and 10 days (i.e., before treatment and 5 and 10 days of treatment); and (4) magnetic resonance imaging perfusion images of the head at 0 and 10 days. The results of a preliminary experiment involving participants receiving the same treatment as in the present study revealed that compared with the control group, the NIHSS score was significantly decreased, the efficacy rate was increased, Glasgow Coma Scale score was significantly increased, serum level of matrix metalloproteinase-9 was significantly decreased, cerebral blood flow and cerebral blood volume on the lesion side were significantly increased, and the mean transit time of contrast agent on the lesion side was significantly shortened in the nalmefene group. Discussion: Findings from this study will provide clinical evidence for use of nalmefene in combination with conventional treatment for large cerebral infarctions and data to support this combined therapy, which can improve the prognosis in patients with large cerebral infarctions. Ethics and dissemination: This study was designed in December 2011. Clinical ethics approval was received in November 2017. This trial was registered in December 2017. Patient recruitment will begin in January 2018 and end in January 2019. Data analysis will be completed in December 2019. Results will be disseminated for publication in a peer-reviewed journal. Trial registration: This trial was registered with the Chinese Clinical Trial Registry (registration number: ChiCTR-IOR-17013871). Pulmonary arterial hypertension (PAH) is a severe, progressive disease characterized by increased pulmonary vascular resistance and right-sided heart failure. Despite the advances in PAH medical treatment, morbidity and mortality rates remain high. Oral anticoagulants are part of the supporting PAH treatment scheme, even though their use is based mainly on non-controlled, single-centered observational studies. The conflicting current research, the potential side effects of the anticoagulation treatment and the ambiguity of the European Society of Cardiology and European Respiratory Society pulmonary hypertension guidelines have raised concerns regarding the implementation of this intervention and heterogeneity in its application in every day clinical practice. A careful selection of the patient subgroups that oral anticoagulation therapy could be beneficial, a consideration of individual patient characteristics and a close monitoring of the anticoagulation treatment could be of importance in order to limit clinician’s concerns and minimize any potential side effects.